In order to sell physical goods on Gumroad, you must sell goods that are not prohibited by our terms of service. Please contact us if you are unsure whether your products are compliant with our TOS. 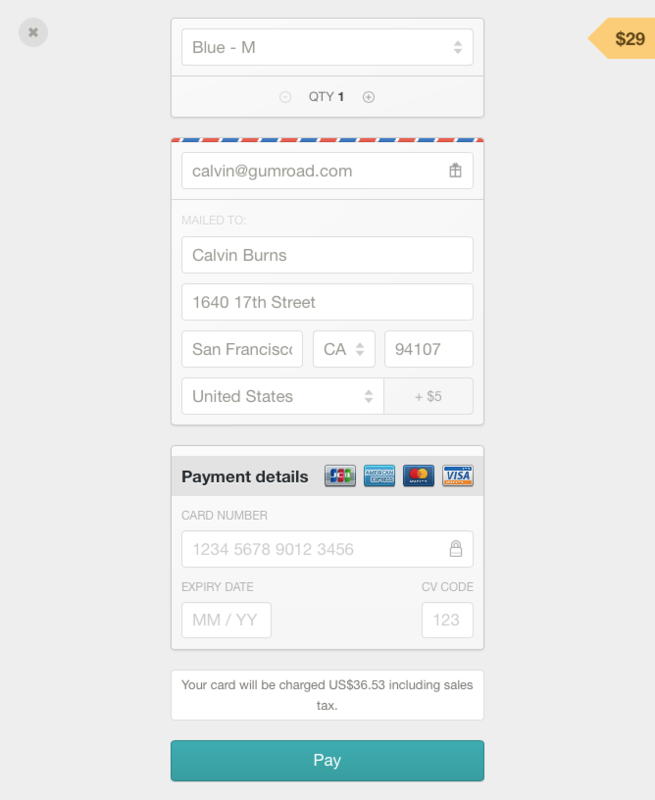 From your Gumroad homepage, click Add a product, then Physical product. You can sell one-off physical products, offer a recurring subscription for a physical good, or set up a pre-order. Give the product a name and price, and click "Add" to move forward in the creation process. Subscriptions let you charge customers a recurring amount, at a monthly, quarterly, semiannual, or annual rate. You can use subscriptions to power anything that involves ongoing delivery of physical goods, for example a t-shirt of the month club or a quarterly print magazine. Once you've set things up, subscribers will be charged automatically, so it's up to you to deliver the awesome goods they're expecting on a regular basis. If a customer cancels their subscription, you will be notified by email, and you will see the word Canceled next to their name in your customers tab. Canceling a subscription does not mean they are refunding themselves. Only you can refund them. With pre-orders, you can accept orders for a physical good before you're ready to ship. You'll be asked to specify a ship date when you create the product. When a customer place a pre-order, we'll verify their card information to make sure the card is valid. We'll then charge their card on the specified ship date. If your product is more than 7 days away from being ready for shipment, we recommend that you set up a pre-order, instead of a standard physical product. Longer gaps between when your customers are charged for your product and when they receive your product can lead to higher chargeback rates from disappointed customers. You aren't required to add a file to your physical product. However, if you want to include a digital version of a physical book or album you're selling, that is an option. You can either add the file(s) now or after you've created the product. 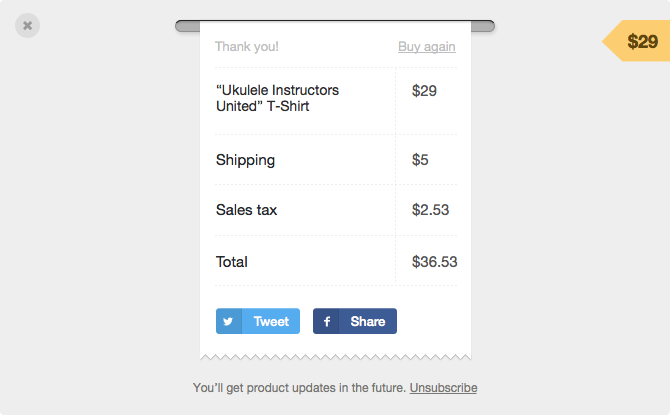 If you add files to your physical product, your customers' receipts will include a download link. You will set shipping prices later (see below), but for now, you can set your base price for the product. It can be a fixed, non-zero price, or you can set a "pay what you want" price. Learn more about Pay What You Want pricing here. Once you've created your product, you can add a cover image and product description. If you've enabled sales tax (more below), you can choose whether to include sales tax in your product's retail price or to charge sales tax on top of your product's retail price. Want to reward a few good fans for their support (or, let's be honest, good looks)? You can create offer codes in the Options tab of your product. Take note though - offer codes will not apply towards the price of shipping. You can also limit the quantity of products you can sell, and limit where your product can be sold in the Options tab of your product. 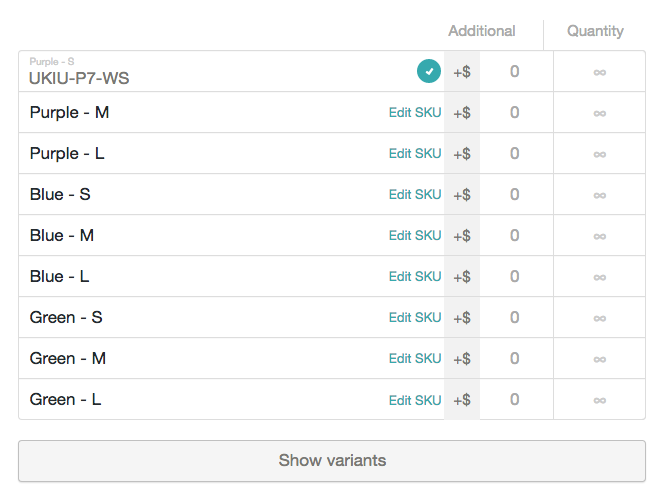 More importantly, you can use the Options tab to set your shipping costs (more below) and to set up variants with unique SKUs (see below). If you haven't yet read our Understanding Sales Tax article, please start there. And be sure to consult your local tax professional prior to making any pricing or financial decision. It's ultimately up to you to collect and remit the proper sales tax amounts. Once you have enabled sales tax in your Gumroad account, you must select the US states where you want to charge tax in your Settings menu. You can include sales tax in the price of your product (inclusive sales tax) or charge sales tax on top of the price of your product (exclusive sales tax). Whether you include sales tax in your product's price or charge sales tax on top of the price is completely up to you. Go to Options tab of the product. Under Shipping destinations, click Add a shipping destination. From the dropdown menu, select a destination country. Then, set a shipping price to that country. You can add as many destinations as you'd like. Only buyers located in the countries that you've added as a shipping destination will be able to purchase your product. If you'd like to make your product available worldwide, add the destination " Elsewhere" and to set a shipping price accordingly. Similarly, if you'd like to charge a single shipping price globally, just add that to the destination "Elsewhere." As soon as your customer enters their shipping address when purchasing your product, the appropriate shipping cost will be automatically added to the total price. You'll need to set at least one shipping destination before you can publish your physical product. For example, if you wanted to offer free shipping worldwide, simply add the shipping destination " Elsewhere" and set the shipping cost to $0. In the Alone field, set the shipping cost for one of your products, by itself. The field With others represents how much shipping will cost for each additional product your customers buy. In the example above, the shipping cost within the United States is $5 Alone, and $2 With others, so shipping will cost $5 to buy one item, $7 for two items, $9 for three, and so on. The shipping costs your customer pays on their first installment will be charged on every subsequent payment installation. Who SKUs? You SKUs! SKUs (Stock Keeping Units) help identify your products, and are used for for keeping inventory and organizing your sales when you sell different variations of a product. For example, if you are selling a t-shirt that comes in three different sizes and three different colors on Gumroad, you would want to set up variants and SKUs. For purposes of simplicity, this is the example we're going to be running with in this article. 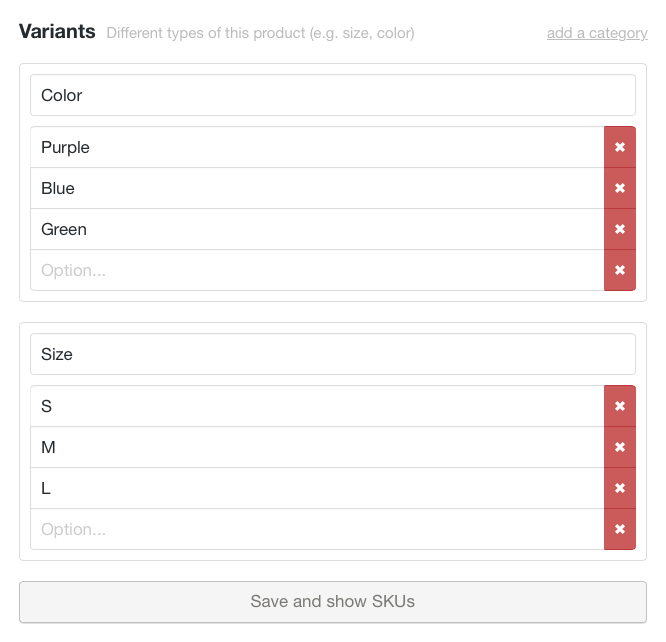 Go to the Options tab of your product and click Variants. Now click Add a category. Create a category name, and add your different options. For example, if your category is "Color" you could add Red, Purple, and Green. For "Size" you could add Small, Medium, and Large. You can add multiple variant categories. When you're ready to move forward, click Save and show SKUs. You can change these variants at any time, or add more if necessary. When you click Save and show SKUs, a separate SKU will automatically be created for each possible combination of variants. You can add the exact quantity of each variant that you have in stock, which limits the amount of times a particular variant can be sold, preventing your customers from eating you out of house and home, as it were. On this tab, you can also add an additional cost to particular variations of your product - for example, if your small Purple t-shirts are woven from pure gold thread, you might want to set up an additional cost for those variants. A) Choose to copy the SKU to your dashboard, and paste it elsewhere to help with your fulfillment need. B) Enter your custom SKUs - just highlight the existing text, delete it, then enter your own SKU and hit the green checkmark. When your product is up and ready to go, hit Publish on the Edit, Options, or Timeline tab of your product. Remember, you need to set at least one shipping destination and shipping price (this price can be $0) before publishing your product. You can start making sales by sharing the URL of your product. Find this URL by going to the Preview page of your product. More on that here. 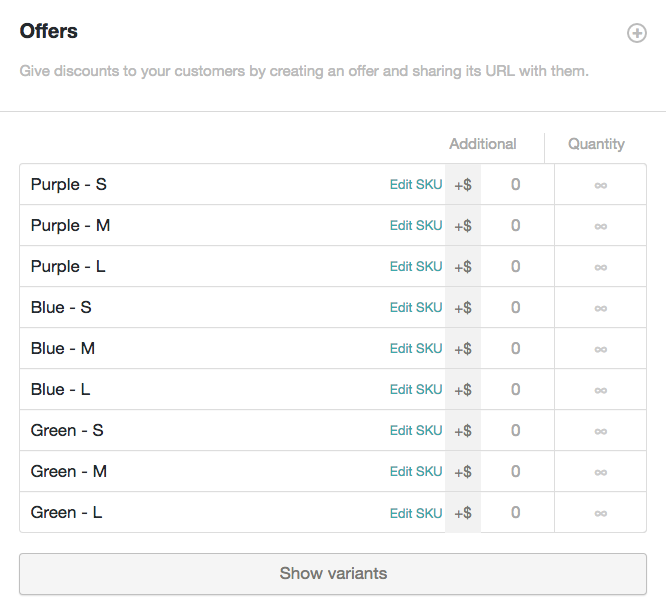 When your customers land on a purchase page, they'll be able to select from the variants you've set up via a dropdown menu. They will also be able to purchase multiple quantities of the product by clicking the + or - icons at the top of the checkout tab. As the quantity is adjusted, the price and shipping costs will increase (or decrease) accordingly. Speaking of which, shipping costs will automatically be added to the total price once your customer enters their shipping address. Sales tax will be added in the same way. Only those customers located in states where you have nexus will be charged sales tax. When your customers have bought the product, they will see a detailed receipt showing how much they paid for the item, for shipping, and for sales tax. While we've provided you with a set of tools to support the selling of physical products, but it is up to you to use those tools to ensure customer satisfaction, increase brand love, and ultimately grow your business through the chatter of happy buyers. As you set up your business, here are some ways to grow it into one that people love to buy from. 2. Be timely with your delivery: Don't forget that someone is waiting with bated breath for your latest creation to be their latest purchase. The sooner you get your product into your customer's hands the sooner they can start crowing about how much they love it. Plan to ship out orders within 5-7 days of sale. This means selling what you have, not what you hope to have. In other words, you should be ready to go to market before you get there. Unfortunately, delayed delivery or non delivery can create a nearly irreversible negative buying experience, hampering your ability to grow your business down the line. Repeatedly delaying shipping puts you at a higher risk of chargebacks from disappointed customers. Your account could be suspended or terminated if your chargeback rate is too high. If your product is more than a week away from beings shipment ready, consider setting up a pre-order instead. This way, excited customers can place an order right away and rest easy knowing that their cards will not be charged until you're 5-7 days away from shipment. 3. Be clear on your method and timing of delivery: Chances are your followers are going to want to track that new purchase like a homing pigeon (ok...maybe more like their arriving Uber driver or pizza delivery). Let your customers know when to expect their order as soon as they've made a purchase and give them a tracking number once their order has shipped. Trust us, they'll thank you for it. Let us know if you have any questions. Otherwise, follow these guidelines and you'll have eager customers lining up for more before you know it.